Early September is an exciting, exhausting, time to have a garden - the tomatoes, peppers, summer squash, and eggplant are all going crazy, and it seems like you can't eat them fast enough! If you find yourself with a few spare zucchini, eggplant, and peppers this week, I highly recommend roughly chopping the lot up, tossing with olive oil, salt, and pepper, grilling up the lot, and making this salad! It's a hearty, nutritious way to use up some of that late-summer produce. Enjoy! Make the marinaded barley: bring a small saucepan of water to a boil. Add the barley and simmer until tender, about 30 minutes. Drain, and toss with the 1/4 c olive oil, lemon juice, cumin, coriander, garlic, chile, salt, and pepper. Cool. Make the grilled vegetables: toss the eggplant, zucchini, and bell pepper with the remaining 1 tbsp olive oil; add salt and pepper to taste. Grill or broil until the veggies are tender and lightly charred; cool. 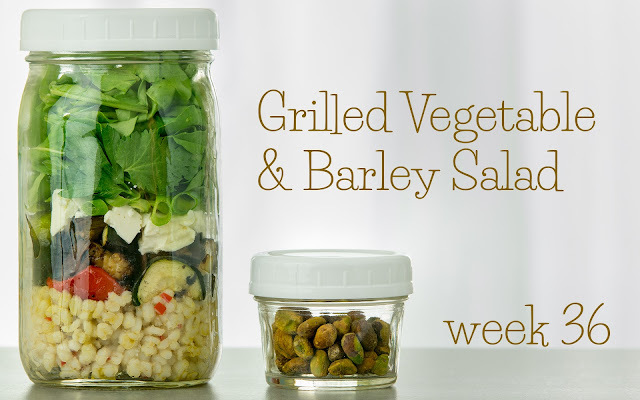 Pack the salads: divide the barley evenly among 4 tall quart-sized containers. 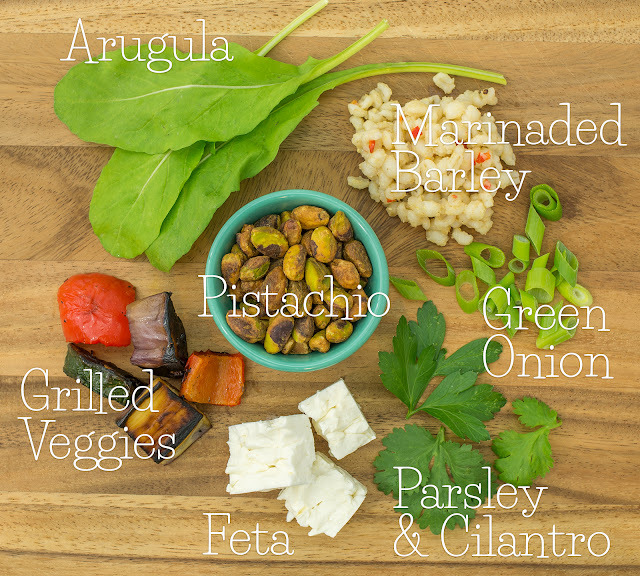 Layer in the roasted veggies, feta, green onion, parsley, cilantro, and arugula. Divide the pistachios evenly between 4 2-oz jars or snack-size zip-top bags, one for each salad. Refrigerate until serving. TIME-SAVING TIPS: Use frozen, pre-cooked brown rice in place of the barley. SPECIAL DIET SWAPS: This salad is vegetarian as-is. For a vegan salad, substitute your favorite vegan feta for the dairy feta. For a gluten-free salad, substitute cooked, cooled quinoa or brown rice for the barley. For a nut-free salad, substitute toasted, salted sunflower seeds for the pistachios.